The amphibious transport dock Mesa Verde left its Naval Station Norfolk pier at 9:05 Wednesday morning as the Bataan Amphibious Ready Group began deploying to the Med and the Libya crisis. As it pulled away, its wake gently lapped up against the starboard-side hull of San Antonio, moored at the next pier over, in what amounted to a love tap. Mesa Verde’s crew might have preferred delivering more of a kick in the rear. 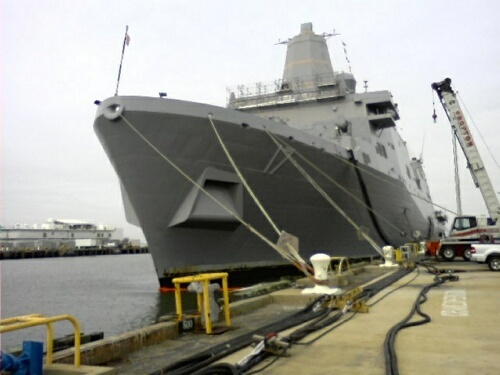 The third ship in the class, Mesa Verde had been home only eight months since its last overseas deployment, and it wasn’t supposed to deploy until late 2012. Instead, it was going to sea more than a year earlier than planned in the place of San Antonio — the class’s lead ship. Commissioned in 2006 and plagued by structural and systemic issues during its maiden and only deployment in 2008-2009, it is still getting undergoing repairs. But there’s light on the horizon. According to the ship’s executive officer, Cmdr. Neil Koprowski, San Antonio is rounding into shape and on April 25 will go to sea for three weeks of intensive sea trials. Koprowski said it’ll be a “full assessment — soup to nuts” — with high visibility. One visitor, he said, will be Adm. John Harvey, commander of Fleet Forces Command, who made the call to hold San Antonio back. If the ship passes muster, it’ll begin a 20-week basic training phase in preparation for getting back into the fleet’s rotation. Then, in October, another test: a visit from the famously tough Board of Inspection and Survey. Koprowski, nine months into the job, is optimistic. “We’re excited about getting back out there and showing the world … we’re gonna do good things,” he said. Lead ships always have issues, but this is truly a great ship, and will do great things for decades. The fact that the follow hulls in this class are performing so brilliantly speaks volumes. Bob—do you work for Northrop Grumman Ship Systems/Ship Building? Or perhaps NAVSEA PMS 377? Your words speak volumes…that maybe you are a part of the consolidated team that is responsible for this ship. Yes, a great ship, but the lack of care, concern, and quality assurance down in Avondale and Pascagoula is the real story here. glenn said: Most of the Aegis, all the large Amphibs and several others were built in In pascagoula with virtually no issues. Both classes with Aegis were split fairly equal between Pascagoula and Bath. The quality of workmanship in MS is WAY below that in ME. I know – I’ve served in ships from both yards. Note the top of the mast falling off that ‘goula DDG recently……..
Really sad that ANY ship is accepted, even conditionally, by the Navy, when it’s in this shape. A far better idea would be to tell the shipyard, “This is really nice, but not what we contracted for…..so you either fix this one, or scrap it and build another, but we are NOT going to accept this as-is”. Maintenance by ship’s force will be a nightmare. When a ship depends too much on technology, problems will result and they do not have the longivity of older type ships. Let’s accept billion dollar warships built poorly and that require constant repair barely after sailaway and better yet let’s order more! Then let’s hide the mess and shake hands and kiss the babies of INSURV! The Assistant Secretary of the Navy (Stackley) was the LPD 17 Program Manager from 2001 thru 2005. Hmmmm….wasnt this when that ship was being built. Hmmm…and wasnt this ship designed by a Team from Avondale and Bath Iron Works? And if I recall…the marines and sailors had a seat as consulting members of the design IPT’s. Ingalls problem was a misguided attempt to get bigger by buying Avondale thereby inheriting this albatros. So…the Navy cannot hold its own people accountable…why should they expect contractors do the same. This ship has one purpose: to get Marines from point A to point B. Yet this thing cost 1.4 Billion to build(more than a DDG), and who knows how much to repair. The Navy should never have taken possession of this piece of junk. As for Pascagoula, I have yet to meet a sailor who has served on a Pascagoula-built ship who will say with a straight face that their ship was built with any quality. I was on a DDG built there in the late 90’s, and after sail away there were so many doors on the main deck that were found that could not be made watertight that it was laughable (This became a major PSA job.) We went back there for PSA and they resurfaced our decks despite the decks being in great shape. During the resurfacing of the the amidships quarterdecks, those fine “craftsmen” not only didn’t take the time to sweep up all the fine steel pellets they used to sandblast the decks, but they swept the tailings under the RSL’s and bolted the bottom plates on. Within months the decks were rusting out. All the time I hear how the navy’s personnel costs are getting out of hand, yet these contractors are never held accountable to the contracts they sign. Look at the LCS class ships. Both Freedom and Independence were supposed to have cost 220 million each, but the real cost is 700 million each. I’ve heard that to reactivate an Iowa class battleship would cost 500 million. But for 200 million more the Navy got a 3,000 ton frigate sized vessel armed with a one 57mm gun and a large flight deck! The people in the Pentagon who are doing the procuring need their heads examined.